“Consumers are not able to find organically grown vegetables easily and those available are either not fresh or too expensive. Also inspite of paying 30-40% more price than the usual market price consumers are not sure if the vegetables are really organic! Besides they want to grow the vegetables but can’t due to constraints such as no backyard or farmland, lack of time, no knowledge/information on growing plants etc. On the other hand, in the routine farming process farmers earn bare minimum, doesn’t have monthly income and their farmland soil health is getting ruined due to excessive use of chemicals. To address both these problems we introduce mini-farm model,” shares Ms. Gitanjali, co-founder and COO, Farmizen. Farmizen links farmers and consumers in mini-farm model. In this, the farmer’s land is divided into 600 square feet mini-farms allotted to each consumer. The vegetables grown in the mini-farm is selected by the consumer and the farmer holds the responsibility for the production. The vegetables harvested are delivered at the consumer’s door step once in a week. In this way the model enables the farmers to earn monthly and consumers get the weekly supply of organic vegetables at their door step. This idea is the brain child of Mr. Shameek Chakravarty, Mr. Sudaakeran Balasubramanian and Ms. Gitanjali Rajamani. The company was formally incorporated in December 2016 at Bangalore, Karnataka. The first farm was launched in June 2017. Presently the company is managing four farms and having 526 customers. The farms of partnered farmers are located within the 20-30 km from city area. The farmland is divided into 600 sq ft mini-farms having 12 raised beds of 4*8 size. On an average 20 veggies can be cultivated in each mini farm. The model focuses only on vegetable cultivation. Most of the vegetables are grown with an exception on potato as it is tough to cultivate in Bangalore climatic conditions. Consumers and farmers are connected with Farmizen through its app. The app is user-friendly as it is largely pictorial. The mini-farms are controlled by the consumers themselves remotely through the app. They install the app, list their pincode, book the farm and get the allotment depending on the availability. Once the farm is allotted they pay the monthly fee of Rs. 2500/month including the delivery charges. 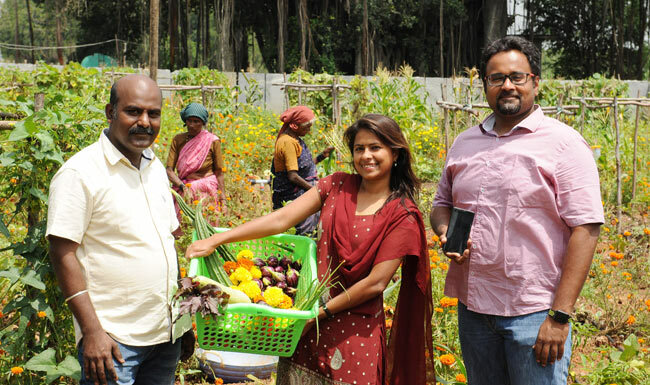 “In the app we provide the names of the vegetables that can be grown in the particular season and consumer can select any 20 veggies out of the available options,” she informs. The farmer takes the responsibility of growing the vegetables with the assistance from Farmizen. Consumers start getting the vegetable delivery from 2nd month as in 1st month the plantation begins. On an average consumer gets 6-7 kg of different vegetables packed in cloth bags at their door step once in a week. 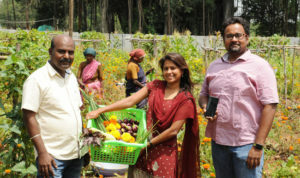 Consumers are free to visit their mini-farm anytime they want and receive regular updates and images on farm’s progress on the app. The subscription continues till the consumer cancels it. Payments are made through the app. The farmer also has a separate app where he gets the notification as which crops are to be grown in which mini-farm. As per the notification received, he progresses with the production schedule. “We provide seeds, manure, bio-pest repellents and other agri inputs to the farmers. In case of some problems in production we give all the assistance especially for pest management as we are 100% organic,” asserts Ms. Gitanjali. In return the farmer gets his revenue share every month from the company. The farmer takes care of production, harvesting and bears the cost of water, electricity and labor. “With us farmers are able to earn five times more than their earlier annual income.” Delivery of vegetables is taken care by Farmizen. As the vegetables are grown organically it implies all the inputs used are natural. “We use heirloom seeds and also hybrid seeds. As we do not get enough quantity of desi seeds we have to use hybrids but we never use GMO seeds. Nevertheless we are trying to move towards desi seeds as much as possible. The manure used is 100% organic that includes cow based agri inputs and bio-nutrients. The cow dung and manure is bought from socially driven gaushalas,” she informs. Challenge faced by the company is mostly in the area of pest management as they are 100% chemical free. They cope up with the issues in production by hiring professional experienced in natural and organic farming. “Nonetheless it is a good learning journey and with experience we are gaining the expertise,” states Ms. Gitanjali. Farmizen now plans to expand its operations within Bangalore and other cities. “Right now we are covering only 10% of Bangalore pincodes thus we are soon going to launch three more farms in different areas. Besides mostly this year we will be going to Chennai and Hyderabad with the same model,” she reveals. The response received to Farmizen by the consumers and farmers is overwhelming. Their first farm was open for booking in June 2017. “It spreads in 1.2 acre and has 80 mini farms. In just 7 days from the launch day all 80 farms were subscribed and we had the waiting list of 500! Similarly now we are receiving many calls from the farmers who have left farming due to umpteen challenges and are in cities doing odd jobs. They want to resume farming partnering with us. It is extremely encouraging. We are glad we able to build a food eco-system that’s better for consumers, better for farmers, and better for the planet,” signs off Ms. Gitanjali.